The popular children’s television show “Sesame Street” recently expressed its support for “lesbian, gay, bi-sexual and transgendered” persons on its official Twitter page, generating a range of public responses, from positive to negative. 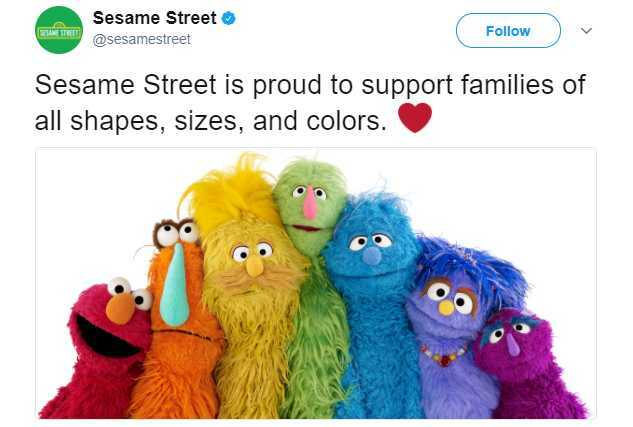 “Sesame Street is proud to support families of all shapes, sizes, and colors,” it wrote on June 23, posting a heart next to the text. It also shared a photograph of various Sesame Street characters lined up in a manner to reflect the colors of the rainbow flag. The post has generated over 134,000 likes as of press time, and over 56,000 retweets. It also resulted in hundreds of comments, with some applauding the children’s television broadcast for publicly supporting homosexuality, and others expressing concern about how the matter will influence children. “Sesame Street, you just saved my soul. Thank you,” one commenter named Gloria Nieto wrote. “This is the greatest pride message I have ever seen. Kudos @sesamestreet for teaching kids that including everybody is fun!” also wrote the user I Like Bonhoeffer. “Are we going to get an #LGBTQ character anytime soon? Talk the talk, then walk the walk,” the user Queer Kid Stuff asked. “Does that include Christian families that maintain a biblical point of view?” asked Derrick Burnette. “I don’t want you to manipulate my children with ideologies. A child [is] always born from a father and a mother, #alterity is a #human #right,” also remarked Christophe. The discussion also carried over onto various news and blog sites. “The seven sets of eyes belonging to those cute, cuddly, vibrant rainbow-colored characters in the Sesame Street tweet weren’t staring at you; they are looking straight into your children’s and grandchildren’s eyes,” he lamented. “Sesame Street” was launched on PBS in 1969 and focused on teaching children numbers and letters, as well as other basic educational lessons for preschoolers and elementary school children. It has since spread its reach to nearly 150 countries, and has been one of the highest-ranking children’s television shows in the United States.